Do you know what two of the most popular pieces of advice that are given to sufferers with hay fever are? We’ll tell you: 1. Stay indoors as much as possible and 2. Keep doors and windows closed. Can you believe that? Poor hay fever sufferers are expected to just ride it out indoors when the pollen count is high. It seems a bit unfair, especially as when the weather is sunny here in the UK, we all rush to enjoy it as heaven knows when we’ll get some more. It’s just unfortunate that the pollen count is generally highest on warmer, dry days! The most common allergen that affects people is grass pollen which affects people from May to July – so pretty much our entire summer – when grass pollen is released. A lot of people dismiss hay fever as something minor or trivial; however studies have proved that it can have a severe effect on people’s quality of life. A blocked or runny nose, sinus trouble, headache, itchy eyes and a scratchy throat can disturb sleep, impair concentration and cause people to miss work and/or school. So it’s no joke! Because grass pollen allergies are so common it means people can’t enjoy something as simple as sitting in their garden on a warm summer’s day. However, we’ve actually seen some improvement in our clients who have replaced their natural lawn with an artificial grass lawn. The effects haven’t been thoroughly tested but a lot of our customers have said how much better they’ve felt and have actually managed to enjoy being in their own garden during high pollen counts. Obviously replacing your natural lawn with artificial grass can’t stop pollen from other gardens being blown into your back or front garden, but there isn’t as much saturation when you take your grass out of the equation. 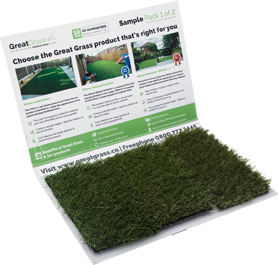 Don’t suffer this summer – contact Great Grass today for advice on artificial grass!